I just haven't been able to expend any words about Dan's recent doings. Its' time to put up a new picture, so I'll have to settle for some nice Fark I picked up today (h/t Michelle Malkin). United Nations: It's the Iraq question. Stalwart UN OFF investigator Claudia Rosett blasts another hole in the sinking ship that was the United Nations. Once more, we find that Kofi Annan is in charge of his own banana republic. Kojo Annan's compensation for his 'efforts' at Cotecna are really a pittance in the scheme of things - the key issue is that Kofi, Kojo, and the United Nations have been deceitful about Kojo's compensation. Well, if they have been deceitful about that, can we trust their assertions about Kojo's participation at Air Harbour Technologies (AHT)? And isn't the question - not did Kojo influence Kofi in his role as an AHT director - but was it really Kofi and Sheikh Yamani (former Saudi Oil Minister) in an influence peddling scheme with Saddam? Might all these revelations just be a UN version of 'shock-and-awe'? The scandal and corruption are so extensive that the Volcker investigation, the Congressional investigations, and the press are tempted to take each cruise missile of newly revealed schlock as item du jour and miss what threatens all of our lives. The ultimate question that remains - and trumps all others - is: Did the United Nations secretariat, France, Germany, Russia, and Syria in collusion with Saddam Hussein commit unrepentant international treachery to subvert the UN Security council on the Iraq question? As for Kojo, now that we know about the Cotecna lies, perhaps we should question the UN assertion about AHT as well. Claudia? Please see my summary of posts on this issue here. UPDATE: Michelle Malkin discusses a move in the right direction. The Command Post references Glenn Reynolds' (InstaPundit) taking on Kofi Annan in the WSJ. Ace wants input on this issue - but then Claudia seems enough. Did I read somewhere that Claudia Rosett deserves a Pulitzer? She does. UPDATE: In the "Would that it were true" department: Scrappleface has UN sending troops against itself. UPDATE: Powerline reports that Senator Coleman demands Kofi Annan's resignation. Please make it stick Senator! UPDATE (12/7): Michelle Malkin picks up the Pulitzer for Rosett call. John Fund (Author of "Stealing Elections: How Voter Fraud Threatens Our Democracy") weighs in at Opinion Journal on the Washington gubernatorial race (h/t Big Trunk at Powerline). It's a good summary of what we have been covering in detail - with Fund's emphasis on what our gubernatorial race means in the national context. WA Governor's Race: For your viewing pleasure - In which I present a video parody of the "Every Vote Counts" mantra dearer to the Democrats than life itself. WA Governor's Race: So how does it happen? - In which we see how the Democratic controlled Canvassing Board use ostensibly blank ballots to 'vote' for their candidate. WA Governor's Race: Final Recount Analysis - In which I assert fraud in the King County recount based on statistical analysis. WA governor's race: Almost can't look - In which I detail statistical characteristics of the recount prior to King County completing its recount and delineate what to look for that might constitute fraud. It's close and they are cheating - Details some events during the recount. Potential vote fraud alert: When is a blank ballot a problem? - Explores why it isn't a good idea to store blank ballots in the same area in which marked ones are stored. That doesn't look right Vern - A look at strange events during the original count in one small county. That one vote swing is looking pretty good right now - Time lapse post on the original count completion. There are several other posts in the summary post - these are just the highlights back to November 16. UPDATE: Huge thanks to Powerline for linking from their original post. Hindrocket over at Powerline makes one of those beautiful, transcendant statements in his Happy Thanksgiving post. Please go read those words, they cannot be improved upon. I am thankful as well that as we have prepared and have begun to participate in this holiday, we have men and women in Iraq and around the world who have been taking it to the terrorists - where the terrorists live - and I'm over here loosening my belt a notch or two. It is the embrace of those God-given rights Hindrocket writes about that called our nation to freedom. As well, that same embrace calls many from among us to serve in our military - and, in some cases, to freshen our freedom with their blood. For me it makes this Thanksgiving more solemn when I remember young men like Joshua Palmer or the twenty-two young men who gave their lives in Fallujah and Baghdad in the last couple of weeks. How can we be thankful to God enough for people like that? UPDATE: We had 'open mike' sharing in church on Sunday - the 28th. I briefly shared about First Lieutenant Palmer, the 22 marines written about in the story above, and the verse from John's gospel. I was overwhelmed with gratitude for the many lives in dedicated service to our noble cause. It was especially poignant to me that these men and women who serve count all of us as a friend worth that level of sacrifice. I am thankful to tears that the great American ideal of freedom is newly freshened by the blood of these patriots and I gain a more heartfelt perspective - as I contemplate that many families received the bodies of their sons for Thanksgiving last week - about the God of the universe sacrificing his Son, his only Son for us. UPDATE: Michelle Malkin has a great summary list of thankful posts. We've noted recently that we've entered a new phase in the Oil For Fraud progam scandal. Well, now we are entering yet another phase - the UN is refusing to release documentation and refusing access to personnel - both at the UN itself and its former accounting firm - and they are refusing it to a sitting United States Senate Committee. This stonewalling has led the Senate committee chair Norm Coleman (Minnesota) and Senator Carl Levin (Michigan) to send a letter earlier this week blasting Kofi Annan for the UN's lack of cooperation in their investigation. Asked for some comment on the Senators' letter - Annan's communication director said the situation was "very awkward" and the Senators' letter was "troubling". Here's what he means: How dare people with a national interest attempt to get us to cooperate with them. We are the United Nations! We won't deign to be coerced into exposing our frauds - especially to nationalists! What do they think - that their government has the authority to investigate the government of the world? I say to send the National Guard in there like I suggested recently. Put sanctions on the UN until they cooperate. That's a 'blast' that they'll understand a little better than a letter. A summary of my posts on Oil For Fraud is here. Also see this detailed report on Fox news. Christine GreGORE (it appears that the Kerry option is out) is *shrilly* and repeatedly calling for every vote to be counted, again and again, and again - apparently forgetting that every vote has been counted twice - and that at least some votes have been newly 'manufactured' out of thin air. She sounds remarkably like Dean Logan, who, unfortunately is in charge of counting all the votes. Please let me beg your pardon, but when we look at the evidence of what has been happening what we hear instead is "every ballot counts for GreGORE" - and some of them, at least, are blank. UPDATE: Digital Brown Pajamas has a great synopsis on the Washington Govenor's race here. WA Governor's Race: So how does it happen? In my last post, I asserted that somewhere just over 15% of the 'new' votes (let's call it ninety-something) that Gregoire received (of a total of 593) in the King County recount were the result of human intention - this based on statistical analysis of the data for the state as compared to King County. There are some who suggest that I'm proposing a conspiracy theory. As you have probably gleaned from previous postings, I do not believe in conspiracies when it comes to the liberal left - because they do what they do in the light of day. So, how does this situation happen like what has happened in the recount in King County? 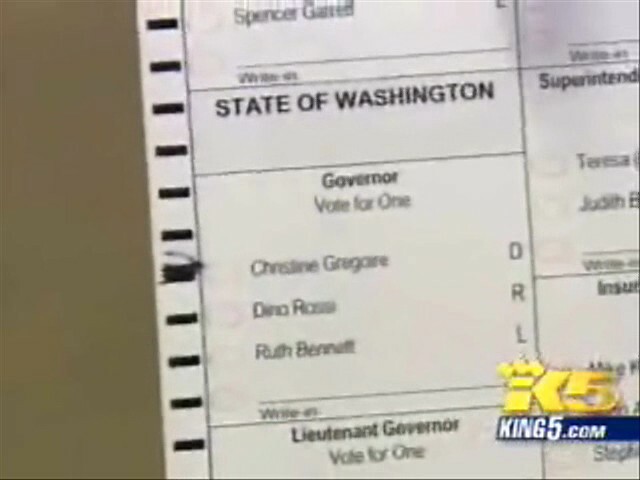 According to the video titled: "Robert Mak reports on ballot enhancements" on this page, King5 asserts that this ballot was promoted to the Canvassing Board and awarded to Gregoire. Guess which party controls the Canvassing Board in King County? Based on what can be seen in the video and in this snapshot, there appears to be a mark of some kind on the left edge of this ballot. From what can be seen on the video and this snapshot, there are no other marks anywhere else on this ballot - certainly not in any visible ovals. This is the sort of mark that you might expect would be the result of someone taking a blank ballot and covertly marking it by carrying it by the edge of the ballot with a marking pen in the left carrying hand - just walking around with such an arrangement will mark the ballot in the way that we can see in this picture. An appropriate response by the Canvassing Board would be to determine whether the mark appeared to be the same ink that is in the marking pens that all of the election workers are apparently using to 'enhance' ballots such as these - or if the ink matched other marking instruments in the counting area. In any event, crediting this ballot to Gregoire, is an act of 'voting' on the part of the Canvassing Board, because, even by the rules posted on the ballot, whoever made that mark is not qualified to be a voter - it could be reasonably postulated that this was the doodling of a child or an incompetent person. According to law and decency, the members of the Canvassing Board cannot cast more than one vote - like the rest of us. Given this evidence, they have broken this trust - most likely repeatedly. So, you wonder how ninety-something strange new votes (of the 593) attributed to Gregoire happened and thus demonstrably skewed the King County recount? This is but one example - and it happened in the light of day. This is also why there should be no more counting. If what happened with this ballot happened - anything can happen. Since the variances are so small, all the values in the table fall within probable statistical error. But they will still yield valuable information if we look inside the numbers for some comparison. We can see that the total of the five counties is very close to the total Gregoire count for King County. We can see that the variance in the count for the five counties for both Gregoire and Rossi is 0.10%. For King County the variance for Gregoire is 0.12%. This is certainly not a large value but it is significant that it is the only one that differs from three other large samples. Here's where the numbers become really significant: Look at the vote ratio between the total vote for each sample and the ratio for the recount for each sample. For the five county sample (all but one are red counties) Rossi leads 51.79% to 48.24%. What about the ratio of the 'new' votes that occurred during the recount? That ratio for the five county sample is: 51.79% to 48.21% - nearly identical to two percentage decimal places (that's ten-thousandths). It is what we would expect. However, this is not true for King County. The total vote ratio for King County is a Gregoire lead of 59.05% to 40.97%. The ratio of the 'new' votes however, is a Gregoire lead of 63.02% to 36.98%. Because of the variance calculation, it seems reasonable that the King County recount produced 348 votes for Rossi - it matches up with all the other numbers in the five county sample. But 593 votes for Gregoire does not. Statistically, that number should be between 499 and 503. During recounting of a large representative sample an undervote new tally is a relatively rare event. When they occur in such a large sample, it is reasonable to have the expectation that they will occur within a very close frequency. What we are expected to believe is that, after collecting a group of samples in which there is almost exact correlation, a representative sample of nearly 1,000 is off by nearly 100 - roughly a ten percent error. If you were doing a thesis, or writing a paper for a journal, or betting someone's life on a product design, this data would not be trusted. I believe that it is a clear example of fraud perpetrated at King County. UPDATE (12/1): There's nothing like new ballots that haven't been seen before showing up to be counted to skew a recount - 336 ballots to be exact. King County is in: a whopping 593 new votes for Gregoire to 348 new votes for Rossi (where did these people come from?). Analysis later. SecState WA site is updated but incorrectly shows Gregoire with the lead (calculating the recount percentages rather than the overall results apparently). Rossi still leads overall by 76 votes. Awaiting (approximately 115,000 votes cast - slightly more for Rossi) Kitsap county results. Time for Gregoire to make the Kerry decision - or the Gore decision. Which will it be? UPDATE: Blog and news sources are reporting 42 vote difference - but SecState site is still at 76 vote difference - with Kitsap unlikely to change that much. Perhaps the media has the numbers already. UPDATE (1:40 PM): Kitsap appears to be updating right now - because their county line has disappeared from the SecState spreadsheet. There is no official Kitsap update yet. (1:49 PM) Kitsap just showed back up in the spreadsheet - with NO update. UPDATE: (2:05 PM): Well, Kitsap is in at SecState - and it was a big change - +15 Gregoire, -19 Rossi, net Gregoire +34 in a Red county. Now we get 42. For Digital Brown-Pajamas readers: The media already had the Kitsap count - it just wasn't reflected at SectState until after 2 PM. Rossi wins by 42. What will it be Christine?